Fall is in full force, and so is the fall bite for bass. Like clockwork each year as the water cools, the rivers around the Midwest heat up! I have shared time at the Mississippi River and Wapsipinicon River this last month and I wouldn't have it any other way. Whether it was a quick couple hours after work, or an entire afternoon, these rivers have not disappointed once. 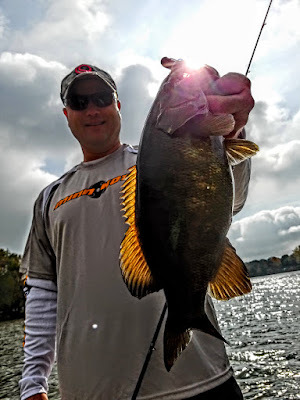 This past weekend I have the privilege to hit the Wapsi on Saturday for a little while and targeted smallmouth bass. They have been hitting well and hanging near the current seams. Spinnerbaits, and Texas rigged tubes have worked really well all month long. It was no different for these smallies today. Fish after fish came aboard the boat on this beautiful day, it isn't often you can fish in a t-shirt on October 29th. The following day on the Wapsi I hooked up the jon boat and went in search of largemouth bass. I never caught one the previous day, and I figured the smaller boat would get me into some backwaters to search out the green bass. I used the same exact 2 Quantum PT combos from the previous smallmouth trip, but today it was all green bass. It was so typical of fall river fishing. Get out of the current, but close to it and you will find largemough bass. Today though, the largemouth bass were really wanting the Hot Rod Baits tube, they wouldn't chase the spinnerbait like their smallmouth cousins did the day before. I never caught a smallmouth all day long, totally different habitat was focused on, which led to totally different fish living there. One day hooking smallmouth bass, the next hooking largemouth bass, river fishing...it is simply the BEST! October is one of those months that brings mixed emotions for anglers around the Midwest. While a lot of guys have changed their rods/reels in for shotguns and shells, October remains one of my favorite times to fish. I keep the Quantum Rods/reels at the ready when my schedule allows to hit the water for a few hours. October brings less boaters, clean water and actively feeding fish. With a recent purchase of jonboat, and the Wapsi only a few minutes away from my house, this month has been a great month to catch bass on this interior river. While the jonboat doesn't have all the bells and whistles of my bass boat, the biggest thing I miss are the Talons, however this jonboat allows me to venture anywhere on the wapsi and get to places that a fiberglass bass boat cannot. Keith Donnelly and I took a trip this afternoon to go on the river to see what we could find. We found some active smallies and largemouth hitting a variety of baits; spinnerbaits, crankbaits, and Hot Rod Baits tubes. Today, for the first day of this month, slower baits produced more bass than the fast bait presentations. I am pretty sure the high pressure had something to do with this. 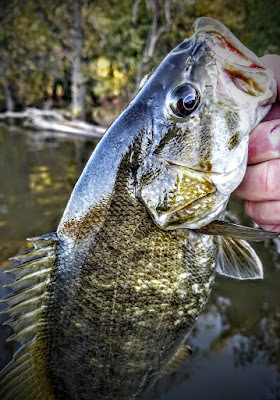 It was a fantastic day to be on the river, shorts, short sleeves and catching bass in October...it doesn't get any better than that! There is no doubt that I have been looking forward to October for quite some time. This summer was an extremely busy one for me, which increased my eagerness for the fall weather to show up. 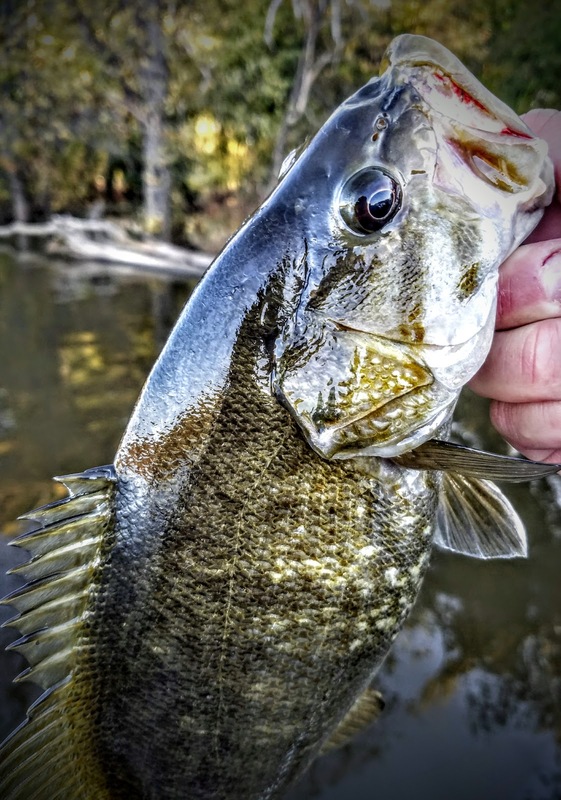 October also means that the rivers get a jolt of energy and the bass fishing takes off. I rarely turn down a time to fish a river system, and this time of year I cannot get enough. This past weekend I was joined by Don Henry for a weekend trip to Pool 9 of the Upper Mississippi. Don also enjoys the river and was looking forward to our, what now has become a tradition, to fish the river in October. 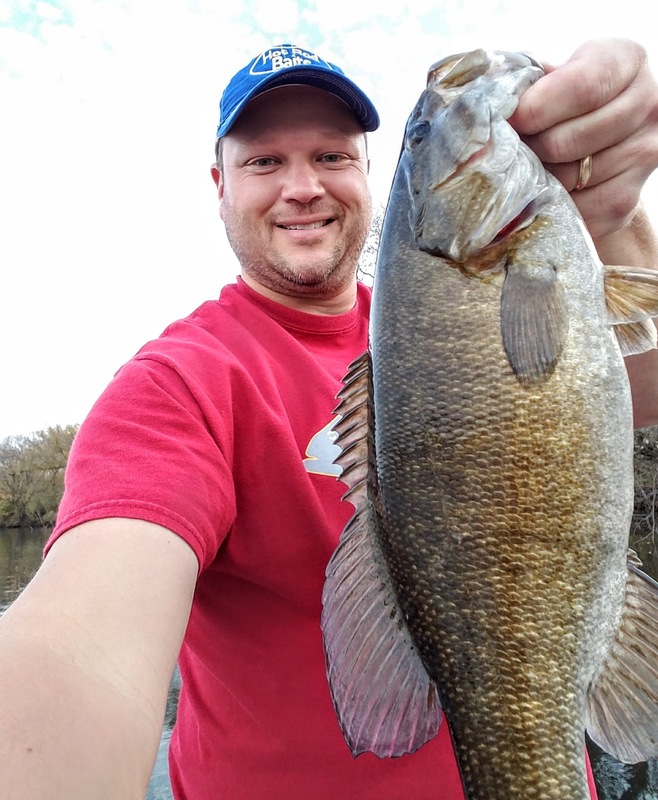 I have said for many years, that this is the best month to fish the river for sheer numbers of bass and the amount of keepers an angler can catch in a day. Don and I eagerly drove north to find a much cleaner river than it was a couple short weeks ago. With the cleaner water, much cooler water and less current there were plenty of bass to keep us busy. We hit several areas, main channel, sloughs with current and backwaters without current, all had bass biting, but locating the current with "medium" current was the key on this weekend. As usual, any rocky structure held bass when current was present. What amazed me the most this weekend, was the bass were very particular on what baits they were going to bite on. They wanted something slow. Craws, small jigs, sticks, and especially tubes from Hot Rod Baits did the most damage. 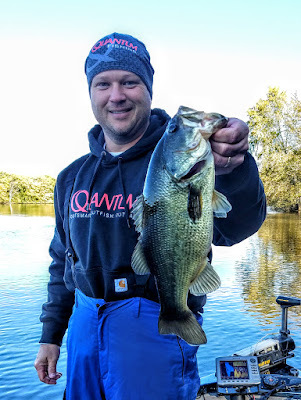 We caught a few on swim jigs, and crankbaits, but not very many. Dozens and dozens of bass came aboard each day on slower presentations, and on Saturday we were able to catch some nice largemouth bass nearing that 3# mark. 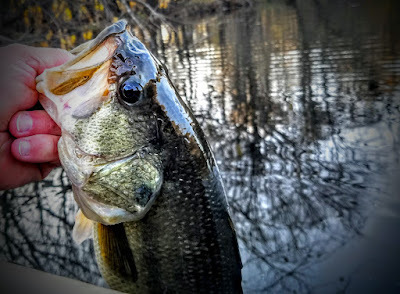 It was great catching high numbers of bass, and having a few big ones tossed in the mix as well. With the river being up about 3 feet, current was easy to find, almost difficult to get out of. We didn't struggle with it at any time over the two days, with the Minn Kota Fortrex 101 on the bow and Minn Kota Talons on the back of the boat, fishing was easy. A quality trolling motor with lasting power and ability to anchor down in current really allows a angler to enjoy fishing, nature and not have to worry about batteries or moving through fishing areas too quickly. Two great tools that every boat deserves. I just got back from the big river, but I can't wait to get there again...yes, I'm addicted!